I’ve recently written about Scrivener templates and different types of content that could be developed using this software. In fact, I’m using it as I write this blog. But for new users, finding information and tracking projects can be confusing. Here’s a short post with a tip to help other new users track their content. Learning robust software like Scrivener can appear daunting when you first start using it. You jump right in and start creating folders and text containers. The binder isn’t too hard to master and writing is writing. But how much did you write? How do you set goals and track them? Fortunately, there are tools available in Scrivener that meet these needs. Words written appear in the bottom bar of Scrivener. This count and amount cover just the container in which you are writing. That’s simple enough. But what if you need more specifics? The answer is the built into Scrivener. 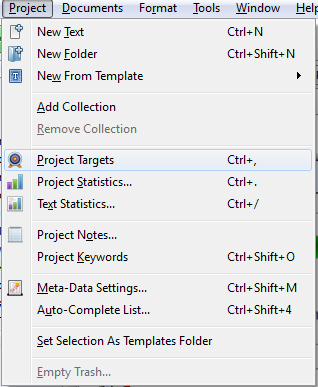 Click the Projects menu and then choose Project Targets. Want to set and track goals? Use these Project settings. 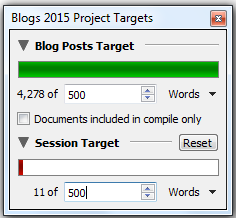 You’ll note that I’ve set this goal to 500 hundreds and my session target to 500 hundred words. If I were writing more later in this same container (for example, if this were a long scene in a book/chapter), I would have another session goal later. By checking my current session I know if I’ve reached my daily goal if that’s important. So that’s an easy way to know how much I’ve done already and what my goal is. 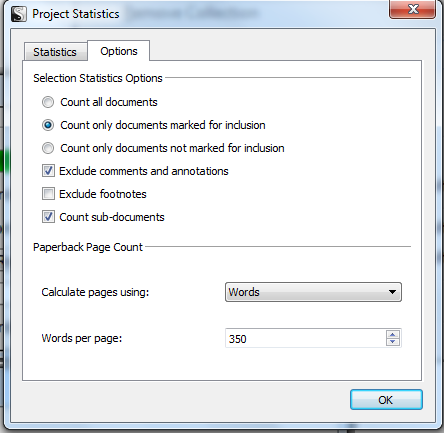 You’ll see what the whole project statistics in words and pages. In my example what is showing is my whole Blog 2015 project which is quite new. But if this were a book that total would be more meaningful. For my current purposes I would be concerned with the second displayed section – Selection. 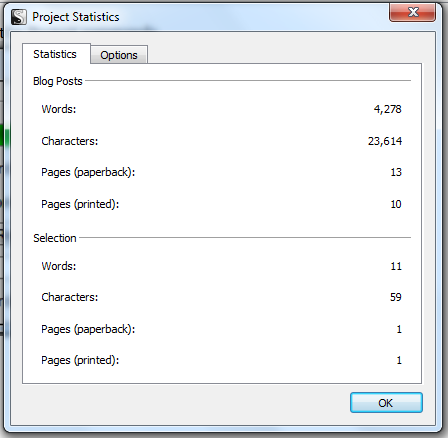 This indicates how many words I have in my current blog. At this point, it’s actually several hundred more words than this screenshot but you get the point. Need more information about what you’re writing? Just click the Projects menu again and choose Text Statistics. Click the arrow beside Word Frequency. This displays information about the your word usage which is very handy to see how often you are repeating words. So there are a few tips on viewing and managing your goals and content. Want to read more of my Scrivener-related posts. 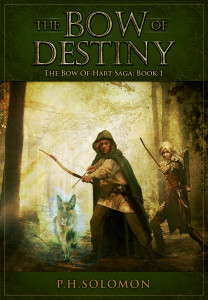 Check some of my recent posts or click the Scrivener category near the end of this page. 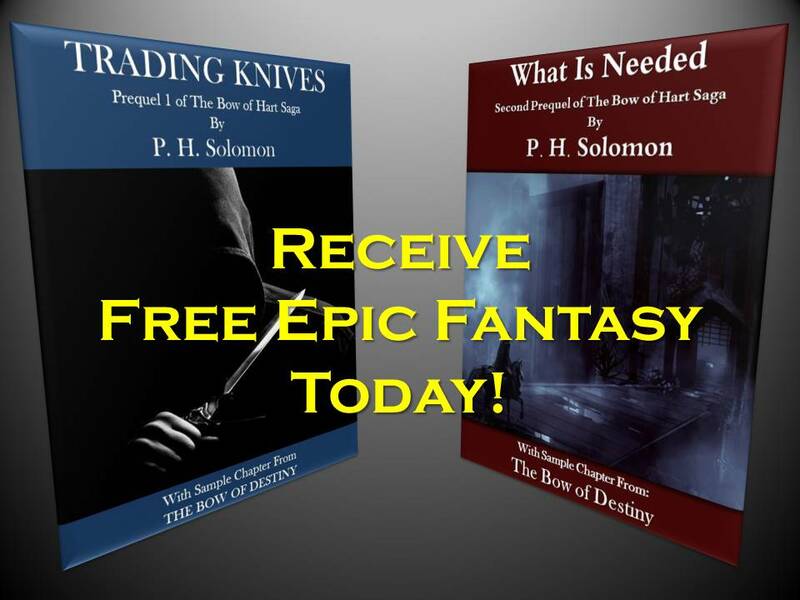 And yes, I did meet – and surpassed – my set goal for this post! Got any Scrivener tips of your own to share? Please share your thoughts and ideas in the comments section. Scrivener screenshots from my 2015 blog project. Cover art for The Black Bag licensed from iStockPhoto. Thanks. I started using Scrivener recently and I’m still trying to get to grips with it. I’ll remember the goals thing. It should be very useful for my next project. Glad to help! Thanks for visiting today. Yet another really useful post. Following a post elsewhere about the merits of Flipboard, I’ve just set myself up on that and have started a whole magazine just for your tips. This one’s going in first! Cool, thanks for spreading the word. I usually re-post some older ones on the weekends. 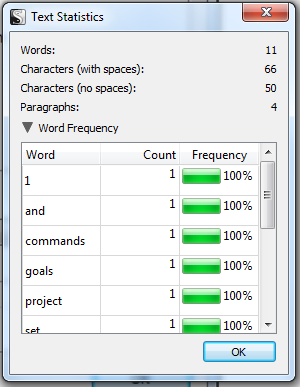 I do nearly all my writing in Scrivener, but hadn’t found the word frequency tool. Have you caught any words you overuse with it? That seems like something I could do with. I don’t really check that as often as I should. I’m also to the point where I write almost everything in Scrivener. Thanks for visiting and commenting. 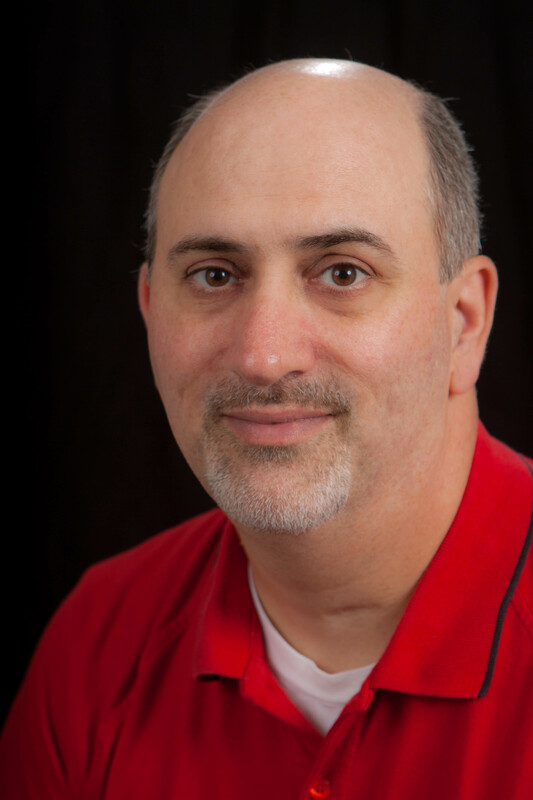 Check out this great post from the Archer’s Aim blog with more helpful Scrivener tips.